iPhone, iPod touch and iPad users invariably go through the jailbreak process on their devices for a variety of different reasons. Some want to alter the aesthetics of the operation system. Some want to introduce additional gestures to navigate through the operating system. Some just want to see what’s available on Cydia and enjoy the freedom to choose how their device operates. It’s unlikely that a large portion of those who have jailbreaked have done so purely to flick between home pages at the tap of an icon, but for those interested in that sort of functionality then the new PageJumps package should scratch that itch. We’ve seen similar tweaks in the past being made available on Cydia, but PageJumps brings the easy page switching functionality to the latest devices along with the compatibility for all of Apple’s newest hardware, such as the iPhone 5 and fifth-generation iPod touch. The functionality of the package is pretty straight forward; tapping a numbered icon immediately moves the user to the corresponding home screen on the device. 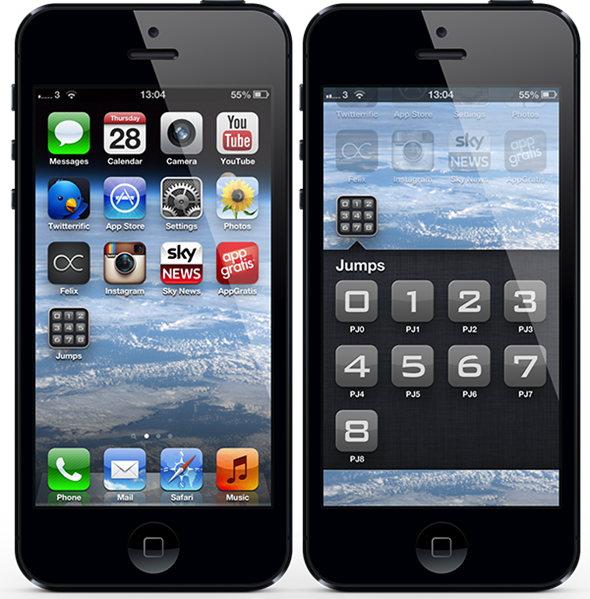 Installation of PageJumps immediately applies nine numbered icons onto the home screen of the jailbroken device. The icons correspond to a page on the device. As an example, the icon named PJ0 takes the user directly to the Spotlight page. The icon named PJ3 will take the user to the third home screen of installed apps and so forth. All of the installed icons are fully Retina-ready, which is great for those using one of Apple’s high-resolution display devices. Icons can also be deleted from the device if a limited number of home screens are in operation. The developer of the package has also ensured that PageJumps’ icons don’t clutter up the home screen and can be placed into a folder to keep them out of sight. Placing them into a folder doesn’t affect the operation of the package. As mentioned earlier, we’ve seen packages in the past such as SpringJumps that offers this type of feature, but it is likely to come in handy for those who are embarking on a new jailbreaking experience. Plus, it’s entirely free-of-charge which is always nice. PageJumps is available as a free of charge download from the BigBoss repo with no specific iOS version requirements being given.